The ‘dancing doctor’ has defended videos of herself dancing over anesthetized patients during plastic surgeries, insisting she had the patients’ consent and was ‘safe’ at all times. 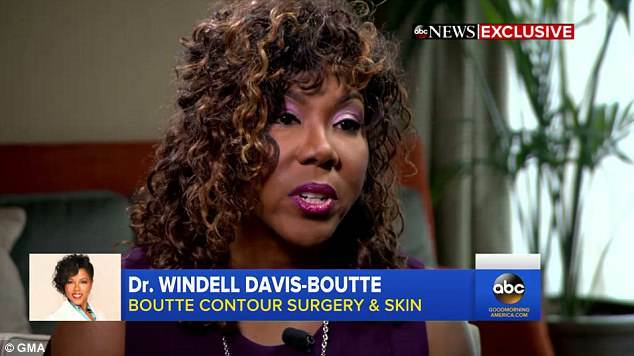 Dr. Windell Davis-Boutte, whose medical license was suspended after the videos came to light, appeared on Good Morning America on Friday. She is hoping that an Atlanta judge will overturn Georgia’s Composite Medical Board’s decision earlier this month. The doctor, who is being sued on behalf of several patients who allege they had botched surgeries including a woman left permanently brain damaged by an operation, claims that the videos never put her patients at risk. ‘The videos were pre-consented, staged, and done at a safe interval,’ Dr. Windell Davis-Boutte said. ‘Many [of the videos], most of them [were recorded] after the fact, during recovery, which was planned by me and the patient. So I would like everyone to understand that.’ She added that they were only 30 second videos, normally shot while the patient was stable in recovery. ‘Everyone was safe,’ she added. However, her account conflicts with those of her patients who claim they were left deformed by her surgeries. One patient, who has not been named, also told ABC that when they were asked for their consent to film the operation, they thought it would be used for medical or educational purposes – not for Davis-Boutte’s YouTube page. Georgia’s Composite Medical Board issued the emergency suspension earlier this month, saying the dermatologist was ‘a threat to the public health, safety and welfare.’ Davis-Boutte also admitted that she didn’t have any nurses in her surgery room, only medical assistants. But the doctor believes that she is simply misunderstood. Boutte suggested that the videos, which she insisted were filmed in a safe and controlled environment towards the end of surgeries, have been taken out of context. ‘Had I had the forethought and the foresight that an entity could take those innocent, consented, educational and celebratory videos, misconstrue them, edit and fabricate the context, and use it for negative agendas, I would not have done it,’ she said. Boutte’s public YouTube channel, which has since been taken down, showed the Lilburn, Georgia, physician performing surgeries while singing, dancing and cavorting over her exposed patients. While Boutte advertises that she is ‘board certified in both surgery and dermatology,’ she is a certified dermatologist and not a board-certified plastic surgeon or general surgeon, according to the Atlanta Journal Constitution. In Georgia, licensed doctors are authorized to perform surgery, even if it is not their specialty. Icilma Cornelius was just weeks away from getting married and earning her PhD when she visited Boutte for a tummy tuck and liposuction in 2016. She did not get married. Thus far Boutte has five malpractice lawsuits pending against her and has reached four settlements, according to CNN. Mitzi McFarland said after her own liposuction with Boutte, she ended up with incisions that looked ‘more like Freddy Krueger cut my stomach’. This isn’t the first time Boutte has come under fire for her work. In 2013, a woman who went to see Boutte at Premiere Dermatology and Surgery for a scalp irritation said she contracted MRSA during the treatment. She said she suffered permanent scars on her scalp as a result.